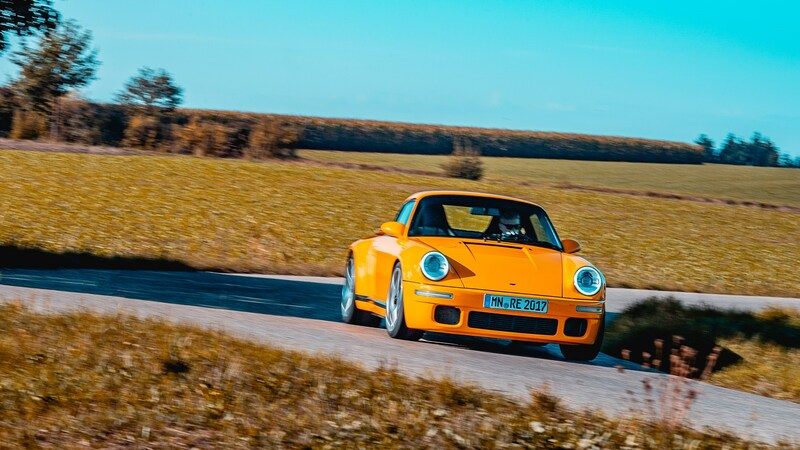 Lest we start to think of Ruf in purely nostalgic terms, there’s a new CTR Yellowbird. 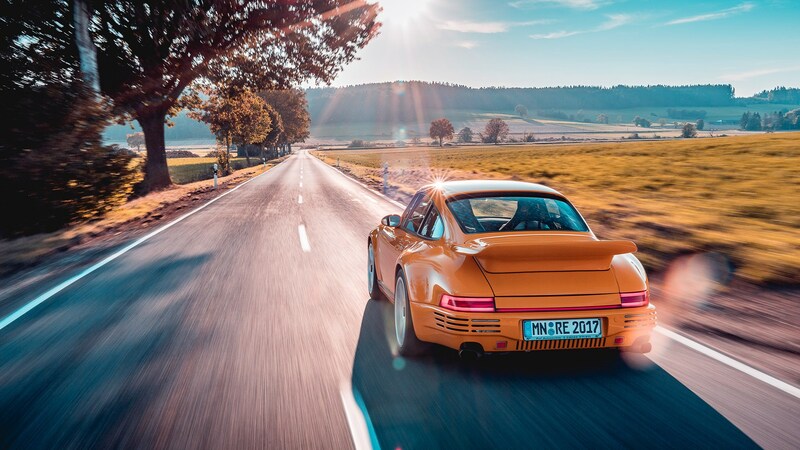 Which is why I’m standing outside Ruf Automobile’s premises in Pfaffenhausen, 90 minutes west of Munich, on an unfeasibly hot autumn day, and doing my best not to jump from one foot to another in terrified glee at the thought of driving this 700bhp time machine. Time to head out for a brief introductory drive in the new CTR prototype with the charismatic and engaging Alois Ruf. Within minutes of leaving the factory we’re rolling on picture-postcard country roads. He drives with a smooth and precise style that effortlessly camouflages his three-figure pace. He revels in the CTRs eyeball-flattening acceleration and Velcro grip. He’s chatty, too, keen to talk about the car that will change his eponymous company for good. ‘Why did we do this now? A number of reasons. The original CTR had such an impact in 1987 that we wanted to honour it, a 30th anniversary if you like. We also had a new generation of Ruf fans coming to us, because they’ve been driving my cars on Gran Turismo and Forza Motorsport. 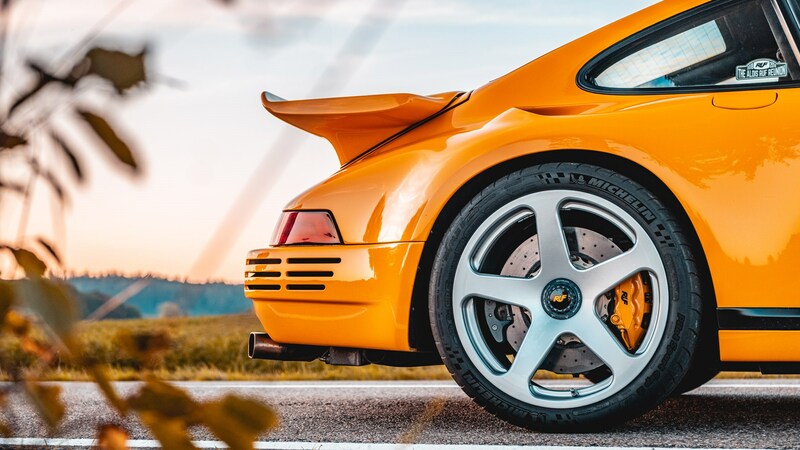 The introduction of this all-new carbonfibre architecture is a landmark moment for Ruf, but what drove the decision to clothe this ultra-advanced bespoke platform in a 964-inspired shape, penned by ex-Porsche designer Freeman Thomas? ‘Well,’ says Ruf, ‘that’s what we like, and it’s what our customers like. We have a very close and intense relationship with our customers – we speak all the time. Besides, I think most modern supercars look like UFOs. 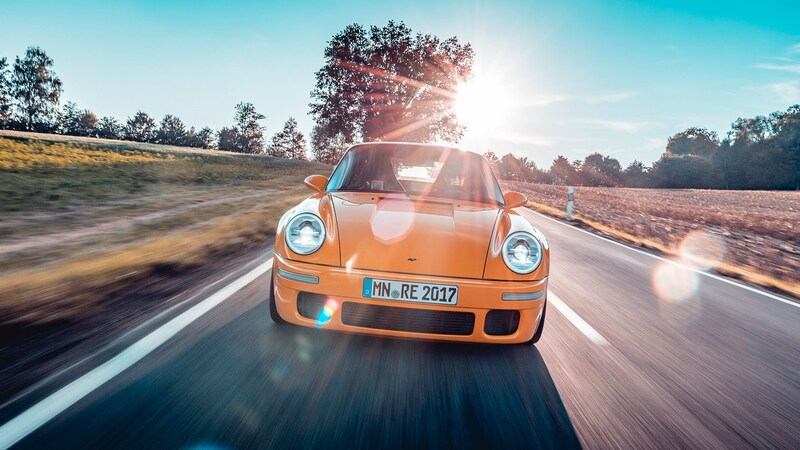 ‘Every Ruf driver has the same expectations around the dynamics of our cars – the ride, the handling, the performance, the technology, the low-weight construction, and the durability. These shared values are what unite our buyers. Driving our cars – that connection between the driver and the cars they drive. That spark, that link is what it’s all about. We are passionate engineers not accountants,’ he says, spitting out the last word with unconcealed contempt. The other eight per cent, he says, will be aimed at tightening up the panel gaps, addressing some of the wind- and road noise, sorting the trip computer display, increasing the volume of the indicator clickers and some further cosmetic work in the pared-back cabin. I ask him if he will build a 30th CTR for his garage. ‘No,’ he says, ‘I’m keeping this prototype for myself.’ And then he hands me its key and smiles. I’m desperate to maximise my drive time with the CTR, but it’s worth taking half an hour to walk round this retro-modern masterpiece and drink in its beautiful engineering and design details. It’s a clean yet emotive shape, one that resonates deeply with anyone who’s experienced the intangible magic of the 911. Key to this visual appeal is the sleek simplicity of the CTR’s silhouette – there are no rain gutters, the door handles are flush mounted, the front and rear lamps are fully integrated, the squat wing mirrors are like an angry cat’s ears. Only the slightly rough and ready exhaust cans that don’t fit snugly into their bumper cut-outs jar. Packaging was Ruf’s biggest challenge; housing everything within the original CTR’s tiny footprint was critical. Rafael Riethmüller, Ruf’s head of dynamics and chief test driver, spills the beans. ‘We went for inboard push-rod suspension – longitudinal at the front and transverse at the rear – to keep the narrow-body look. Although it’s wider than a 959, it intentionally looks narrow and sleek. The longer doors have much wider shoulders, and the wheelbase is 70mm longer than the original Yellowbird – there’s an extra 20mm ahead of the A-pillar to accommodate the longer doors, and 50mm behind the B-pillar,’ explains Riethmüller. Despite their similarity, only the windscreen, side windows and A- and B-pillars are shared with the original CTR Yellowbird. In the new car, the roof is kept narrow by incorporating the air intakes in the tear-dropped rear windows. The fuel tank is now 85 litres, 20 litres more than the original, and the fuel filler is housed on the highest point of the bonnet rather than the right-hand wing. The rear filler cap is for engine oil. Shorter overhangs means the CTR’s overall length is exactly the same as its Nürburgring-scalding forebear. Dropping down into the CTR’s fixed-back driver’s seat, with its black-and-white houndstooth upholstery, I’m faced with a simple horizontal dash that houses five big circular dials – speedometer calibrated to 400km/h in 50km/h increments and boost gauge reaching 1.4 bar in 0.2 bar steps. 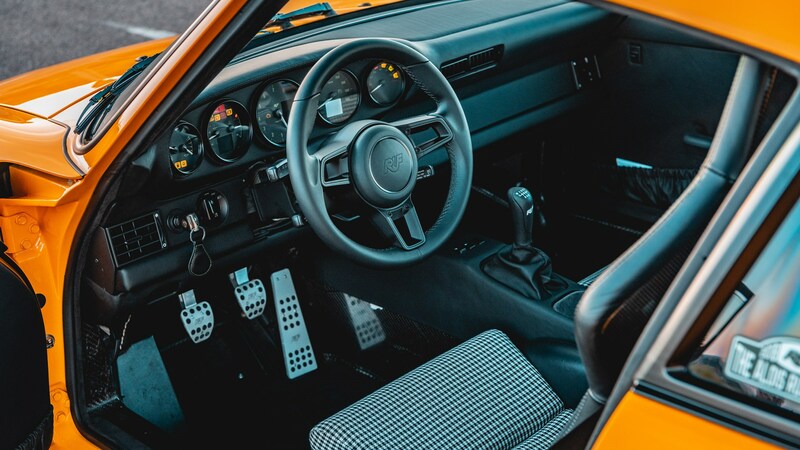 The driving position is perfect – bum just a few inches off the road, top-hinged clutch and brake pedals and floor-hinged accelerator perfectly placed dead ahead, steering wheel close and high, stumpy shoulders jutting out ahead of you. The near-vertical windscreen and dainty pillars mean visibility is goldfish-bowl good. There’s even that judder-clatter-clatter from the drivetrain as I pull away into the traffic and head out of town. For a 700bhp tyre-melter the CTR is surprisingly docile as I thread it through town. Even at urban speeds you relish the perfect weighting of the controls, marvel at the compliant ride quality, enjoy the hyper-responsive steering and notice that for a prototype, build quality and overall integrity are top drawer. It’s as if your dream 911 has just spent six months detoxing at boot camp. It’s leaner, harder, faster and more ferocious, shorn of all extraneous elements that blur the link between car and driver. The roads open up. Traffic is non-existent. Time to find out what the 700bhp, 1200kg CTR feels like on unfamiliar winding Bavarian B-roads. Oh my. There’s the slightest of pauses and then, with the engine filling the cabin with a raucous cacophony of bellows, burps, snuffles and snorts, I’m catapulted down the road by an avalanche of acceleration. The first distinct kick arrives as the tacho needle sweeps past 2500rpm, slapping a big grin all over my face. The second punch at 5000rpm signals that you have levelled up and been rewarded with a seemingly endless supply of teeth-clenching, expletive-inducing thrust. ferocity. There’s no mouth-drying squirm, no white-knuckle loss of traction from the acres of Michelin Pilot Sport Cup 2 rear rubber, no flashing warning lights, just vivid fibre-optic broadband speed in a world of dial-up. The CTR has been shaped by its geography. At an easy 120mph lope, it breathes and flows over roads that ribbon their way across this beautiful landscape. Stability is deeply impressive. At speed the CTR feels welded to the road, its stubby nose pointing resolutely straight ahead. It sits so securely on the tarmac, as if it weighs a couple of tonnes, and yet with a tweak of steering it will change direction without a hint of slack or a moment of hesitation. And the steering, oh lordy, the steering. It’s lightly assisted, so although hefty around town it takes on a gorgeous delicacy as speeds rise, the wheel minutely but constantly bucking and writhing in your hands as it informs you of events and conditions below. That feedback, that continuous flow from the front, is something every Lotus driver will recognise. The immediate steering response combined with a very quick rack – just under two-and-a-half turns between the lock-stops – means it takes only the smallest and most precise of inputs to flick the CTR cleanly and precisely from one sweeper to another. Roll, pitch and dive? Nope, not in the CTR’s vocabulary, just the perfect relationship between momentum and mass.